Andrew LO: Why is it the case that we have billionaires? Why should they exist? The economist Andrew Lo is a finance professor at M.I.T. LO: That’s a very strange concept for an economist because we usually think that markets are reasonably competitive. If it’s reasonably competitive, then no one person should be able to make billions and billions of dollars. LO: And he came up with that notion to try to explain the difference between ordinary businesses that would make a reasonable living versus these incredible captains of industry — the Andrew Mellons and, at that time, the incredible wealth that was generated by a relatively small number of entrepreneurs. These are people that, in today’s dollars, would be multi-billionaires. Now, we all know the conventional wisdom — that the big rewards in life go to the people willing to take big risks, right? Frank Knight saw it a bit differently. LO: He realized that the way you make a huge amount of money is not to take on risk. The reason is because risk, by his definition, is the kind of randomness that you can quantify. And if you can quantify it, so can everybody else. You can’t really outsmart other people because they can calculate just as well as you can. So using probability and statistics, you can calculate risk. And because the odds of a given risk can be calculated, that risk can also be priced. LO: Exactly. A good example is the insurance industry. So risk is the stuff of actuarial tables. Taking on risk might make you a good living. But it wouldn’t have made you a multi-billionaire. To do that, Frank Knight argued, you had to take on something else entirely: uncertainty. LO: For example, if you create an entirely new industry that didn’t exist before, there’s no way to calculate what the odds are. When Bill Gates started up Microsoft, we didn’t have a huge PC and software industry. He created that. He couldn’t sit down and calculate what the odds [were]. Knight came up with this idea that the way you really make money, the way innovation really occurs in the economy, is through taking on uncertainty, not taking on risk. LO: The difference was highlighted in a really neat experiment that was done in the 1960s by an economist by the name of Daniel Ellsberg. Most people remember Ellsberg not because of his economics, but because he was the fellow who released the Pentagon Papers in the 1970s. NEWS CLIP:… to begin with, how did you get the papers? LO: But before he did that, he actually did some really pioneering work in economics. The experiment goes like this: imagine if I have an urn. In this urn, I’ve got 100 balls and 50 of the balls are colored red and 50 of them are colored black. And you and I are going to play a game where you pick a color, red or black. Don’t tell me what it is, but write it down on a piece of paper. Then I’m going to draw a ball out of this urn. If the color of the ball that I draw is the color you wrote down, I’m going to pay you $10,000. And if it’s not, I’m going to pay you nothing. Now the question is: how much would you be willing to pay to play that game? LO: When most people think about the odds, they come up with an answer of about $5,000, because that’s the expected value. That’s the probability of getting the ball of your color multiplied by the odds of winning. That’s an example of risk. You know what the odds are. LO: … much, much less than $5,000. This is an example of uncertainty. You don’t know the odds, and so therefore you’re much less likely to want to play. And that, in a nutshell, is the difference between risk and uncertainty. LO: The fact that risk allows us to make these inferences while uncertainty doesn’t means that from an evolutionary perspective our brains are going to start telling us “Red alert, stay away from an uncertain environment.” Because, from an evolutionary perspective, we actually need to know what’s out there. Because what you don’t know can kill you. URSCHEL: I don’t know. And it’s extremely hard to know. Today on Freakonomics Radio: risk versus uncertainty in the real world — but a part of the real world that most of us will never get near. URSCHEL in a previous Freakonomics Radio episode: In football, I just love running around and hitting people. It’s not a bad deal. The National Football League begins its new season this week. Football is far more than just the biggest sport in America. It’s part of our calendar; part of our social fabric. Even during the off-season it makes big news. Among the three biggest stories this off-season: the New England Patriots quarterback Tom Brady, arguably the best quarterback in history, turned forty, and is still amazingly good. The quarterback Colin Kaerpernick, meanwhile, has no team — in part, it is suspected, because he has chosen to not stand during the national anthem; it’s Kaepernick’s protest against what he calls “a country that oppresses black people and people of color.” A third big story this summer: a Baltimore Ravens offensive lineman named John Urschel, entering the prime of his career, abruptly retired. At age 26. 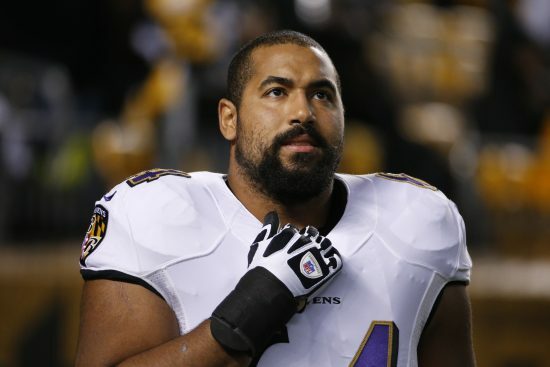 URSCHEL: I told the Ravens, the Ravens announced it and then all of a sudden … This was a very naïve thing of me. I was really hoping to just go out quietly. URSCHEL: On July 27, I had a lot of phone calls, certainly in the hundreds of phone calls and this was, frankly, a nightmare for me. I don’t really relish being the center of attention and I’m trending on Twitter. People are writing articles and people are making guesses as to my motivations. Why did a relatively obscure player suddenly turn into such a big story? That’s pretty simple. He quit football just two days after the publication of a study that assembled the most compelling evidence to date on the relationship between football and brain damage. And: John Urschel has a particularly compelling brain. He has bachelor’s and master’s degrees in math from Penn State, where he also taught math while playing college football. He’s published papers in major journals — like “On the Maximal Error of Spectral Approximation of Graph Bisection,” which appeared in Linear and Multilinear Algebra. Also: he’s been working toward a Ph.D. in math at M.I.T. URSCHEL: Yes. For the majority of my N.F.L. career, actually. DUBNER: How did that work out? When did you do what, as a doctoral candidate, around the football season? URSCHEL: Well, I was — I shouldn’t say “was.” I am a full time Ph.D. student at M.I.T. and I was full-time the entire time, so there wasn’t really any working around to be done. DUBNER: But, obviously during the football season you’re not attending classes. That’s not possible right? Football’s [a] very full time job. URSCHEL: Yes, of course. This is a natural question. I guess since I’m retired, I’m allowed to say, I was full-time, full-time. For example, last fall I took courses at M.I.T. URSCHEL: Yes. Via correspondence. I took courses which I thought were very manageable in season; areas that I was more or less familiar with previously, classes which had a textbook, which the professor followed the textbook and I would just do the assignments and then just send them in. DUBNER: You say that you can tell me, “Now that you’re retired.” Am I to gather, then, that you didn’t tell the Ravens that you were actually full-time at M.I.T. during the football season? URSCHEL: I did not tell anyone this. Well, except M.I.T. But I don’t think an N.F.L. team would be extremely happy to hear that I’m working towards my Ph.D. also in the fall. DUBNER: How did a standard day work out? URSCHEL: My schedule — to put the M.I.T. things in perspective — what I would do is, I would play the game on Sunday. Then from Sunday — suppose it’s a home game, one o’clock kickoff. I get home around 5:00, perhaps 5:30. From Sunday, 5:30 p.m. until Tuesday, say, 11:00 a.m. — when I have to go into the Ravens — all I am doing is M.I.T. coursework and math. That is all I am doing. M.I.T. accepted me as a Ph.D. student, but they don’t have part-time Ph.D. students. If I have to finish in four years, maybe five, this is just completely infeasible if I’m only working on the Ph.D. half a year. DUBNER: Gotcha. You said that it would have been hard to do your coursework during the later part of the week. That’s because the intensity of the football week is building and you’re getting more in your brain in terms of game plans and the opponent and so on? URSCHEL: Yes. Your focus is very much on your opponent. Wednesday and Thursday in the N.F.L. are full eight-hour, seven-to-four days, or eight-to-five days. You’re very tired at the end. You have to watch film of practice. You have to watch film of your opponent and even Friday, Saturday, you’re really preparing for the opponent. You’re really getting your mind right for those things. DUBNER: Was the reason that you didn’t do work later in the week because you would have felt it was cheating your team, the Ravens, and maybe the fans and the league? URSCHEL: Yes, of course. Very much so. As we spoke, Urschel was planning to move from Baltimore to Boston, with his fiance. URSCHEL: My fiance’s name is Louisa Thomas. She is a historical nonfiction author. The two of them will soon be three. URSCHEL: Yes. I’m expecting a baby girl. Her name is going to be Joanna. We were speaking in August. In previous years, Urschel would have spent August training for the N.F.L. season, or — before that, the college or high-school football season. This time, he was on vacation, along with the rest of America. URSCHEL: I actually didn’t even know that August was like the vacation month. This is news to me. He and his fiance were in St. Louis for a chess vacation. Chess is a fairly new but serious passion of Urschel’s. St. Louis is the site of the Sinequefield Cup. URSCHEL: It’s an elite chess tournament. It’s been very enjoyable for me. He’s not nearly good enough yet to compete in this kind of tourney; he was there as a spectator. URSCHEL: You can go up and watch them play. You can go into separate places and watch commentary. Certainly, you can grab a beer and chat with your friends about the game. So John Urschel is just another 26-year-old, chess-spectating former N.F.L. lineman getting a Ph.D. in math at M.I.T. How did that happen? URSCHEL: I grew up in Buffalo, New York with my mother. My father left when I was three, though I have a good relationship with him and he’s a good guy. DUBNER: He was a surgeon, ultimately, yes? URSCHEL: He was a thoracic surgeon. He was the chief of surgery at Harvard’s hospital in Boston, Beth Israel, before he retired. DUBNER: He had played college football, I believe. Yes? URSCHEL: That is correct. He played college ball at the University of Alberta initially, as an offensive lineman, and then he moved to linebacker. DUBNER: Your mom, then, I understand, became a lawyer? URSCHEL: Yes, that is correct. DUBNER: What were you into and not into as a kid? URSCHEL: As a kid I was very much into puzzles. Math puzzles, any puzzles really. I was quite into horror movies. DUBNER: Now, what about sports as a kid? URSCHEL: I believe when I was younger, my mom put me in indoor soccer. My mom was not quite in favor of me playing football. Actually, ever, now that I think about it. But my father was in favor of it. In high school, Urschel was a good enough player and student to be recruited by, among others, Stanford, Princeton, and Cornell. URSCHEL: I visit Cornell, and they show me the best time of my life. I almost commit to Cornell on the spot. Those familiar with football recruiting and how those things go … That works! DUBNER: Can you give us some details on what was so great about this visit? DUBNER: Did it involve alcohol or other generally forbidden substances? Urschel’s dream school — and one of his mom’s dream schools too — was Stanford. But after showing interest in Urschel, they disappeared. URSCHEL: Penn State offers me, very late. I make a visit to Penn State. I commit on the spot. I just fell in love with the people and also it was my best option. I go home and the Monday after the weekend of my official visit to Penn State, who calls me? Jim Harbaugh. Harbaugh was, at the time, the head coach at Stanford. He also happens to be the brother of John Harbaugh, who would become Urschel’s head coach in the N.F.L. Penn State wasn’t expecting all that much from Urschel. URSCHEL: I was the 26th out of 27 people they got for their class. I’m also undersized, I’m only about 265 at the time. I just put my head down and I worked hard. I worked hard in the weight room. I worked extremely hard to try to improve my technique as an offensive lineman. I always like to say that my math talent came fairly easily. My football talent very much less so. It was a lot of hard work, a lot of long hours. Urschel had an outstanding college career, winning athletic and academic awards. URSCHEL: Yes. It started to become apparent to me that I’d have a chance to play in the N.F.L. URSCHEL: Didn’t even cross my mind. I was 100 percent pro-N.F.L. Just the dream of playing the sport I love at the highest level —this was a no-brainer. In hindsight, it would still be a no-brainer. Urschel was not a superstar with the Ravens — but to be fair, very few offensive linemen are. They do the dirty work that most fans don’t pay attention to. But he had an absolute blast. URSCHEL: The thing I really love about playing offensive line is it’s a very physical, visceral position. Every play I’m fighting with a defensive lineman or a linebacker, where they are trying to get through me to physically tackle someone and I am doing everything I can to stop them, whether in somewhat of a passive fashion or an extremely active one. In his second year, during a pre-season practice, Urschel got a concussion. URSCHEL: I believe I was playing left guard. I pulled right to trap out the defensive end or outside linebacker. I got a little bit more than I bargained for and I was knocked unconscious. DUBNER: What was the treatment like for you, then? URSCHEL: I walked off the field. Note that the Ravens did try to cart me off the field. URSCHEL: But I was being my stupid self. I walked off the field. They checked me for a concussion. They diagnosed me with a concussion and I was in concussion protocol for perhaps two weeks, I believe. I had some trouble passing this so-called “ImPACT test.” I just wasn’t quite feeling well, nor feeling myself. DUBNER: What did you notice about your brain during this concussion-recovery period? URSCHEL: It was tough for me to do high-level math. I really tried to. I really wanted to because there was actually a paper that I had been working on that I was really proud of because it was going to be my first, like big, solo-authored math paper. I just wanted to keep working on it to finish it. I really couldn’t because I had really hard times thinking through things and visualizing things. Thankfully I got the paper done and I was really happy to have it accepted. It all ended well. But at the time I was frustrated. LO: From an evolutionary perspective, we actually need to know what’s out there. LO: Because what you don’t know can kill you. “Objectively, I shouldn’t [take the risk],” Urschel went on. “I have a bright career ahead of me in mathematics. … But … I play because I love the game. I love hitting people.” Then, a few months later, Urschel got the concussion that left him unable to do high-level math. DUBNER: Did you think about retiring or quitting football right then? URSCHEL: Actually I didn’t. I didn’t actually think about it at all. I want[ed] to keep playing football. I loved the game and I was very much focused on being the best offensive lineman in the N.F.L. I could be. Coming up on Freakonomics Radio: what finally changed John Urschel’s mind? McKEE: It’s clear that there is a link and that there’s a problem in football. It’s not what any of us wanted to hear. How did his head coach take the news that he was quitting? URSCHEL: He even called me recently to check in on me and see how things are going at M.I.T. And: how sympathetic has the N.F.L. been, historically, on the issue of brain health? Alan SCHWARZ: As far as the N.F.L. goes, they’re bullies. Even if you don’t follow football at all, you’ve likely heard that it has a huge problem. SCHWARZ: It was really when guys started blowing their brains out and having their brain tissue examined for a degenerative brain disease — that’s when things started getting pretty icky. SCHWARZ: And I’m a journalist and author based in New York. The brain disease is called C.T.E., or Chronic Traumatic Encephalopathy. McKEE: It’s characterized by a deposition of a protein called tau, and that accumulates in nerve cells and other cells throughout the brain. Ann McKee is a neuropathologist who directs the C.T.E. Center at Boston University School of Medicine. McKEE: It starts as very focal problems or abnormalities, but then over the decades becomes a devastating neurological condition. It causes memory loss, cognitive changes, behavioral changes, like aggression, impulsivity, depression, and it can be very disabling with time. Alan Schwarz wrote 130 articles for The New York Times about concussions or brain trauma in sports, primarily football. SCHWARZ: There were two reasons why this blew up in football’s face, or in the N.F.L.’s face. One is players started dying and were found to have the brain disease. And then the the N.F.L. put up such a fuss saying, “Oh there’s nothing happening here, we have our scientists who have shown” — they played the perfect villain. We had something that resembled the tobacco industry. Former players were dying young, sometimes by suicide. Older players were completely losing their faculties. And, occasionally, a current player would quit the game young, afraid of long-term brain damage. SCHWARZ: As far as the N.F.L. goes, they’re bullies. They have been able to quash every public-relations problem in their history in the sense that — whether it’s domestic violence recently, whether it’s steroids, whether it’s the strikes and lockouts— there are games to be played on Sunday and everyone forgets by then. But this is one public-relations crisis that they have lost. McKEE: My feelings about the sport have definitely evolved. The brain researcher Ann McKee again. McKEE: I was born and raised right outside of Green Bay, Wisconsin. My brothers played football. In fact, I was an absolutely enormous Packer fan, and because I was raised in such a football-centric community, I have always had a terrific admiration for football players. But then she began to study the brains of deceased players. McKEE: At one point I could compartmentalize. I could still enjoy the games, I could watch them on Sunday on the television. But at this point I can no longer dissociate what I’m seeing under the microscope. After listening to hundreds and hundreds of stories of profound tragedy, I can’t look at the game anymore without imagining what might happen to some of those players. One challenge in brain research is that a lot of it can only be done post-mortem. McKEE: Being able to detect changes in the brains of living athletes, looking at structural changes after playing seasons, and also being able to detect C.T.E. is going to be absolutely a game-changer — pardon the pun — in research going forward. But for now, researchers like McKee work with brains donated by the families of people who’ve died. McKEE: I run a number of different brain banks. I have the Framingham Heart Study brain bank. We have the Alzheimer’s brain bank. We have an A.L.S. brain bank. We have P.T.S.D. We see that the incidence of C.T.E. in those other brain banks is extremely low. But then in this brain bank, where the criteria for inclusion was participation in football and that was the only criteria, we see a very high percentage of C.T.E. It’s impossible for me to dissociate the risk of playing football from the risk of C.T.E. It’s been nearly 10 years since McKee began finding evidence of C.T.E. in the brains of deceased football players. Sometimes she’ll meet with family members after she’s done the analysis. The memory of one such visitor has stuck with her. McKEE: Her father had died, and she came to the lab and wanted to look at the slides. She was an adult — she was 30s or 40s. I remember she looked at the brain. I explained it to her and she seemed fine with it. Then a bit later, I saw her really crouched in a corner and sobbing. I was wondering, “Why? Had I upset her? Had I [given] too much information with the brain autopsy?” It wasn’t that at all. She was so overwhelmed because she suddenly realized that her father had loved her; that his behavior of not remembering her birthday, not remembering details of her life, or seeming distant was actually part of his illness and not part of a dad who didn’t care. SCHWARZ: Women are the heroes of all of this, in my opinion. SCHWARZ: They were the ones who really stuck up to the N.F.L. and stood up to the N.F.L. It was Sylvia Mackey, the wife of John Mackey who wrote to Commissioner Paul Tagliabue to say that her husband had early dementia and she knew a lot of wives dealing with their husbands and former players and appealing to the N.F.L. to help, which started a charity for families. Linda Sanchez was the Congressperson most involved in all of this, and most caring. Gay Culverhouse, the former president of the Tampa Bay Buccaneers, is the only N.F.L. executive to come out and speak out about the issue of brain trauma among former players — happens to be a woman. Culverhouse is no longer the only such executive, but she was the first. Ann McKee’s latest study, co-authored with more than two dozen fellow researchers, was published in The Journal of the American Medical Association in July. Just as John Urschel was getting ready to play his fourth season in the N.F.L. The fourth season, by the way, is typically the last season an N.F.L. player is bound by his rookie contract. Which can mean an even bigger payday the next year. URSCHEL: Money just like showering, allegedly. DUBNER: What did you see as your financial future within football? URSCHEL: I don’t know … I didn’t really think about it that much. I don’t really spend money that much and I’m quite happy with my bank account. There’s nothing I really want to spend money on. I buy books, on occasion, like chess books, math books. That’s about it. This new study was unprecedented in scope. McKEE: This is the largest case series by far of American football players. It included brains donated from 202 deceased former players, across all levels of the game; 111 of them had played in the N.F.L. McKEE: And we did this very rigorous neuropathologic examination. We had defined criteria to make the diagnosis and we had a team of four neuropathologists who looked at the cases. What did McKee and her colleagues find? McKEE: And so, ultimately we found that, I believe, the overall was 87 percent of the football players in the series had C.T.E., and that included 99 percent of former N.F.L. players. URSCHEL: Here’s my thing about this study — and this is something that bothers me — the big headline is like 99 percent of like N.F.L. brains they looked at had C.T.E. It was 99 percent, right? DUBNER: Yeah, more than that — 110 out of 111. McKEE: Yeah. I don’t think we’re at the point where we can talk about a definitive risk estimate for an N.F.L. player. I do think the 99 percent — although we have said in every interview and we said it very clearly in that paper — that number became larger than life. But that wasn’t because of the authors of the scientific manuscript. URSCHEL: Frankly, there is a strong case of self-selection bias there and that cannot be ignored. DUBNER: In other words, the brains that are being donated to this bank were from families or players who suspected that they had C.T.E. or something close to that. Is that what you’re talking about? URSCHEL: Yes. I can’t say that I know for certain that it’s self-selection bias. But my instincts tell me it’s extremely likely that it is. DUBNER: I assume the timing of the study and your decision were not coincidental? URSCHEL: No, I don’t think it was necessarily coincidental but I don’t think it was necessarily directly causal. The best, the easiest way I can explain it is that it was causal in one respect but not in the way that most people think it was. The way that it was causal is that it really reopened the dialogue within, talking to myself and also between myself and my fiance. It really opened a dialogue that I had not opened in an extremely long time. DUBNER: Why was that? I mean, can I psychoanalyze you for one second? URSCHEL: Yes, of course, feel free. DUBNER: Is [it] because you loved playing football so much that even though the rational part of your brain — that maybe contained the mathematical abilities in your brain — you were able to override that or quiet it down so that you could keep doing what you wanted to do? URSCHEL: Yes! That’s a good way to put it. This thing comes out and obviously it’s not 99 percent. Like it’s 99 percent in the study but it’s like, for me, is my chances 99 percent? I highly doubt it. Is it 0 percent? I highly doubt it. But it’s not 99 percent and the biggest thing it did was it made me say, “I should actually probably think about this again.” Not like, “This new evidence is extremely overwhelming [and changes] my opinion.” It’s more like, “This really brings something to my attention in a very real way that, quite frankly, I was more or less aware of but attempting to ignore to a degree.” In the back of my head, I had already been having these thoughts to some degree about my longevity and how long I wanted to play. The main thing that I thought about [was], “What was I most passionate about and what was I most excited about in life going forward?” When I thought about, “What are these one or two or three things?” Football, all of a sudden, was not one of these top two or three things. Football is actually actively hindering me from doing some of these things. Well, then it became a real conversation. DUBNER: Was your fiance eager and ready for you to not only open this dialogue but to make the decision that you did? DUBNER: What about your mom? URSCHEL: Yes, she has been ready. DUBNER: What about your dad? URSCHEL: Not in favor. Yes. So what I did was I called John. DUBNER: John Harbaugh, the coach. URSCHEL: I thanked him and the Ravens, because quite frankly I thoroughly loved my time in the N.F.L., I loved my time with the Ravens. He expressed sentiments that he has the utmost respect for me. I stressed that these are mutual feelings. Yeah. John and I, we had a very positive conversation. He even called me recently to check in on me and see how things are going at M.I.T. URSCHEL: Yes. This was actually a serious concern of mine. Because, yes I am retiring, I did retire. But at the same time, I love the N.F.L. I love football. I wouldn’t trade my experiences for the world. I do believe football is a great game. I didn’t want to be, for lack of a better word, I didn’t want to be perhaps fodder for certain anti-football establishments. DUBNER: Do you think football survives long-term? URSCHEL: Yes. Yes, of course. SCHWARZ: I take no pleasure at all in the suggestion that I might have helped kill off football. That, again, is Alan Schwarz, whose reporting in the New York Times highlighted the connection between football and brain damage. SCHWARZ: I hope that football stays around and I’m very confident that it will. SCHWARZ: Because two things: N.F.L. owners are not in the business of having their $2 billion assets disappear. And the game will adapt. I’m not sure exactly how all this is going to play out, but the game — it’s a great game. It’s just played more recklessly than the market will allow. McKEE: Because this affects a game we love, a game that defines communities, a game that is really the lifeblood for many colleges, there’s a lot of resistance to really addressing this problem in the way it should be addressed. McKEE: I just want people to be aware of this disease and I want individuals who decide to play football or continue to play football to be aware of it so that they can make as many individual changes to keep their head out of the game, to limit the amount of head impacts they experience, and make as an informed decision as they can regarding their own future. And what is the N.F.L. doing? The league sent us a statement that read, in part, “The N.F.L. has made real strides to do everything it can to better protect players and make the game safer,” and it pointed to 47 rule changes since 2002. These include requiring more medical personnel to help diagnose head injuries; more careful treatment of players suspected of sustaining a concussion; and the prohibition of certain plays and procedures that have been deemed too risky. McKEE: The responsible thing is to make some real changes in the game: limiting the amount of head contact, limiting practice, raising the age that children start to play football, maybe limiting playing career, and really addressing — with some strong research support — how to identify this disease in people while they’re still living and come up with treatments for it. All that said, Ann McKee says it’s hard to know exactly what to do since the science on brain injury is still young. And since there are some surprising wrinkles — like the correlation, or lack thereof, between concussions and C.T.E. McKEE: Repeatedly in our studies, we’ve looked at concussion and number of concussions. In none of the studies have concussions correlated with the development of C.T.E. We’ve had individuals with no reported concussions who have C.T.E., and we’ve had individuals with a number, high numbers of concussions, who don’t have C.T.E. But the one thing that seems to be holding up: it’s years of exposure to the sport and the length of playing career and the number of subconcussive hits. That is: the same impacts that lead to concussions in some people and symptoms don’t rise to the level of symptoms in others. It’s really the duration of the career — the cumulative number of what we call subconcussive hits — that seems to correlate best with the presence and severity of C.T.E. There’s one more point about the brain — obvious, maybe, but often overlooked. McKEE: The brain is just this marvel. It really controls our personality, our thoughts, our experiences, our emotion, even our reflexes, and our athleticism. Because that’s what the risk is here. It’s not like an arm or a knee. You’ll still be the same person even if you have difficulty moving or pain when you move. But the brain is actually your identity. Especially if you’re the kind of person getting your Ph.D. in math at M.I.T..
URSCHEL: I’m interested in Voronoi diagrams, centroidal Voronoi tessellations, but also interested in other things. My advisor is this guy Michel Goemans, and he specializes in combinatorial optimization. I’ve been working on a lot of combinatorial optimization lately, and this is what I’ve been learning a lot about. I do have diverse interests. DUBNER: I do want to hear what you think about the extent of any brain damage you may have done by playing all the football you’ve played. URSCHEL: That’s a good question. How much brain damage do I have? I don’t know. And it’s extremely hard to know. While there are encouraging signs for me at the moment because I don’t have any problems currently — again, I don’t know. And I don’t know how much of an effect having played football will have on my experiences later in life. To know with certainty is a very hard thing in this area, I believe. John Urschel always knew that playing football involved risks — as does just about anything in life. But: when risk tipped into uncertainty — well, that seems to have been his tipping point. LO: From my own perspective I think it’s wise because doing mathematics could provide a lifetime of pleasure and success, whereas being a very successful football player can provide you with 5 to 10, maybe 15 years of success. That, again, is Andrew Lo, who teaches finance at M.I.T. Maybe he and Urschel can be friends! John McWHORTER: I find it fascinating that there are seven thousand different ways to do what we’re doing right now. Maria Luisa MACIEIRA: Isso vem no próximo episódio. Oleg IVANOV: Это будет в следующем выпуске. Dayana MUSTAK: Episod seterusnya dalam Radio Freakonomics. Anisa SILVA: Yang akan datang selanjutnya. Rendell de KORT: Esey ta sigi proximo. Freakonomics Radio is produced by WNYC Studios and Dubner Productions. This episode was produced by Stephanie Tam with help from Eliza Lambert. Please don’t take our fair treatment of John Urschel and the Baltimore Ravens as any sort of endorsement of the Ravens; Freakonomics Radio is firmly a fan of the Pittsburgh Steelers. Our staff also includes Alison Hockenberry, Merritt Jacob, Greg Rosalsky, Emma Morgenstern, Harry Huggins and Brian Gutierrez; the music you hear throughout the episode was composed by Luis Guerra. Special thanks to Andy Lanset, New York Public Radio’s Director of Archives. You can subscribe to Freakonomics Radio on Apple Podcasts, Stitcher, or wherever you get your podcasts. You can also find us on Twitter, Facebook, or via email at radio@freakonomics.com. Andrew Lo, professor of finance at the Massachusetts Institute of Technology. Ann McKee, professor of neurology and pathology at Boston University. John Urschel, Ph.D. candidate in mathematics at M.I.T. and former lineman for the Baltimore Ravens. “111 N.F.L. Brains. All But One Had C.T.E.,” Joe Ward, Josh Williams and Sam Manchester, The New York Times (July 25, 2017). “Advances and Gaps in Understanding Chronic Traumatic Encephalophy: From Pugilists to American Football Players,” Gil Rabinovici (2017). “Clinicopathological Evaluation of Chronic Traumatic Encephalopathy in Players of American Football,” Robert Cantu, Lee Goldstein, Douglas Katz, Robert Stern, Thor Stein, Ann McKee et al (2017). “Long-term Consequences of Repetitive Brain Trauma: Chronic Traumatic Encephalopathy,” Robert Stern, David Riley, Daniel Daneshvar, Christopher Nowinski, Robert Cantu, Ann McKee (2011). “Mild Traumatic Brain Injury: A Risk Factor for Neurodegeneration,” Brandon Gavett, Robert Stern, Robert Cantu, Christopher Nowinski and Ann McKee (2010). Risk, Uncertainty and Profit by Frank Knight (Martino Fine Books, 1921). “Why I Still Play Football,” John Urschel, The Player’s Tribune (March 18, 2015). Adaptive Markets: Financial Evolution at the Speed of Thought by Andrew Lo (Princeton University Press, 2017). “An Egghead’s Guide to the Super Bowl,” Freakonomics Radio (February 2, 2017). “On the Maximal Error of Spectral Approximation of Graph Bisection,” John Urschel and Ludmil Zikatanov (2015). Next Post »These Shoes Are Killing Me!